Tomorrow's Table: Organic Farming, Genetics, and the Future of Food has been on my 'must read' list for quite a while now. But with all the work I do in agriculture every day, and 10+ years working in the industry, I wasn't sure what I could really expect to learn from another book on agriculture technology and the policy debates that surround it. 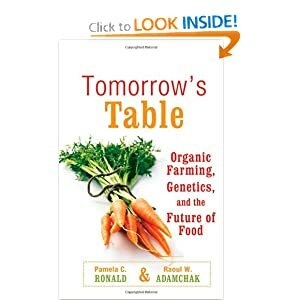 Tomorrow's Table is co-authored by Pamela Ronald, an articulate and accomplished plant scientist and professor at the University of California-Davis, and Raoul Adamchak, an equally articulate and accomplished organic farmer in California. They happen to be married, and together have produced a very personal and fascinating primer on the technologies and issues at play in agriculture these days. I love the book's basic approach of explaining new agriculture technologies by describing historic and current agriculture technologies and practices first. For people who don't have a good practical understanding of how agriculture works today, new technologies seem exotic and overly complicated. It's important to know just how complex agriculture has become, and why. The descriptions of farming practices, agriculture businesses of all kinds, and technologies are among the best I've ever read. The chapters are all structured around real-life experiences of the authors in their work and at home. For example, the chapter "Who owns the seed?" begins with Adamchak eagerly thumbing through a new seed catalog. As he describes the different characteristics and costs of the seeds, we learn how new varieties are developed, how 'heirloom' varieties are preserved, the use of hybrids and the pluses and minuses of each from the perspective of someone who actually grows them. Building on this context and understanding, Ronald writes the following chapter, "Who owns the genes?" These episodes in each chapter are perfect examples of what I call 'seed stories' -- that begin in familiar and concrete experiences and then illuminate the much more complex issues behind them. I also appreciated the fact that the book is written from the perspectives of a university-based scientist and a farmer. It doesn't represent the pro-technology agenda, or an anti-corporate mindset, nor is it a dry a policy treatise. Since I left the corporate world three years ago, I have come to really value and appreciate the different ways that there are to talk about agriculture science and technology -- particularly those that thread a narrow but distinct and important path between louder proponents and opponents. Finally, throughout the book there are engaging descriptions of conversations that the two authors have with students, colleagues and family members. These discussions are sometimes difficult, particularly among those with different opinions or beliefs about agriculture. But they are always respectful and seem to always end with everyone gaining a new insight. I admire the authors' open willingness to have these talks, and I wish all my conversations about agriculture technology could be this way! I've already been recommending this book to colleagues -- and I'll probably even buy a few copies for friends and family. Check it out!